I'm not one to play fantasy sports, but I came across this "Beat the Streak" contest for the 2011 MLB season. The object of the contest is simple. For each "game day" pick a player who you think will get a hit. Be the FIRST to beat the streak of 56 games with a correct pick, and you win $5,600,000.00 Yes, that number is typed correctly. I double-checked it. I don't know about you, but I could use $5.6 million. on April 8, 2010. He went 0-4. So far the longest streak is 8 games. Atlanta Braves' Jason Heyward was hitless last night against the Milwaukee Brewers and killed my streak of 4 games... Ugh. **** Actualy, I just took a look at my photo files, and just last year I saw him against go hitless against the Chicago Cubs... Great. Good thing, I checked my upcoming picks today because I had selected Manny Ramirez for an upcoming game. 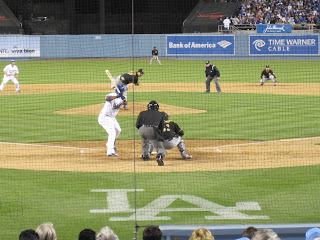 With Manny's retirement announcement today, I doubt he'll be hitting again ~ period. Don't get me wrong, I liked Manny. Manny Ramirez debuted with the Cleveland Indians in 1993. 1993 was also my freshman year of college, in Northeast Ohio, so I spent many a night at Jacobs Field (i.e. now named Progressive Field). Manny was loved in Cleveland. 1993-2002 were some great days for the Cleveland Indians. Those were the days of David Justice, Kenny Lofton, Omar Vizquel, Sandy Alomar, Roberto Alomar, Jim Thome, and Manny Ramirez... I'm sure I'm forgetting some folks, but you know what I'm talking about. Come to think of it, my best friend (i.e. Chubs) had a picture of Manny Ramirez in his spare bedroom. He loved that picture. It may have even been autographed. Oh well. 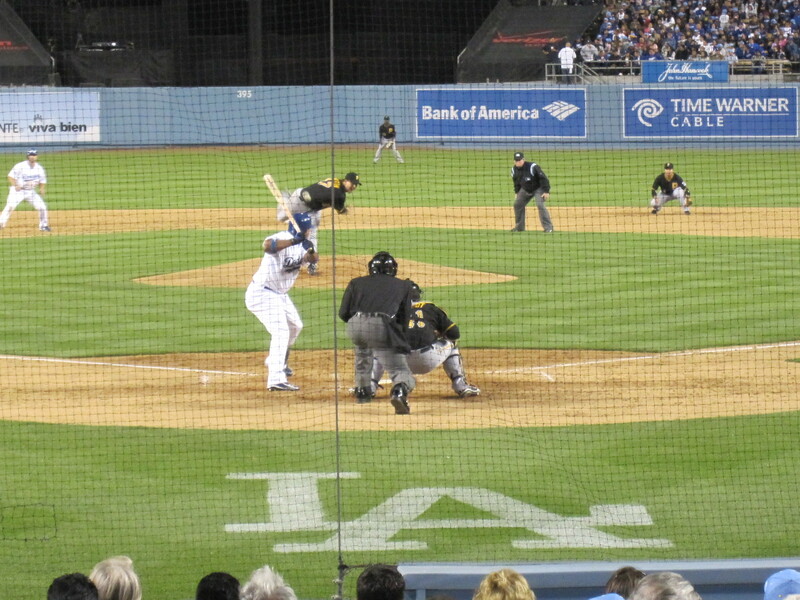 The last time I saw Manny Ramirez play was less than a year ago against the Pittsburgh Pirates. In addition to it being my first time at Dodgers Stadium, Kareem Abdul-Jabbar threw out the ceremonial first pitch. **** Kareem's presence made the game extra special for me since I'm an "old school" Laker fan. But I digress... So, let's get back to this blog post's topic. Play the Beat the Streak contest and test your luck. Further, with ANOTHER announcement of an issue relating to baseball's drug policy, it's hard to love a cheater ~ especially a cheater who's calling it quits. Therefore, if you have Manny in any of your fantasy baseball contests, replace him now. thanks for the link to your post, todd! i read it. i agree w/you that the mitchell report doesn't count ~ we need to go by actual failed tests. in your opinion, and i know you said you're conflicted ~ what's worse: PEDs or gambling on the game (i.e. pete rose)?